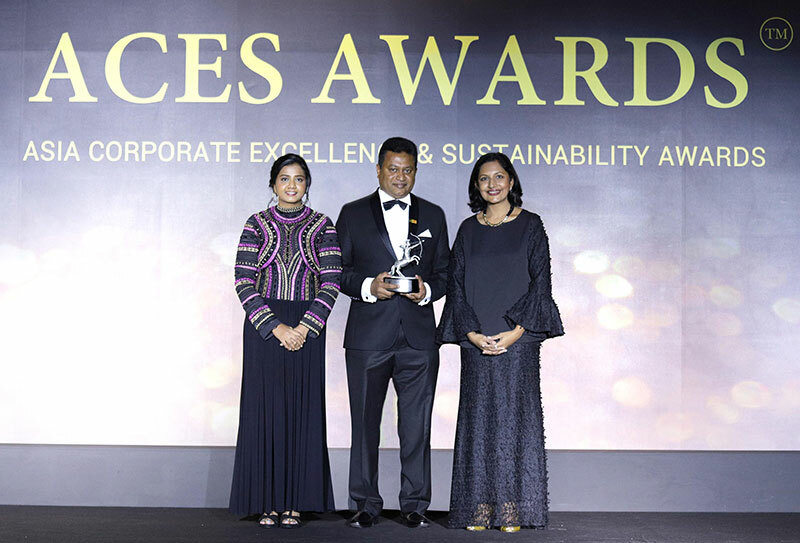 The Commercial Bank of Ceylon was declared the winner of the ‘Green Company of the Year’ title at the 2018 Asia Corporate Excellence & Sustainability (ACES) Awards that honour the region’s finest and most responsible corporate leaders. The prestigious ‘Green Company of the Year’ title was awarded to the Commercial Bank for its contribution to the environment by offering sustainable finance products to clients to adopt environmentally responsible practices. The candidates that qualified for this prestigious award were judged on a Sustainability Matrix that encompassed products & innovation, leadership value, ethical compliance, diversity & inclusion, and community empowerment. The award for the ‘Green Company of the Year’ can be attributed to the Bank’s stringent evaluation of credit proposals to gauge their impact on the environment and the sustainability of the projects; support to sustainable energy projects of its clients through lending; and for its own efforts in making its operations more environment friendly. Commercial Bank adopts a Social and Environmental Management System (SEMS) to assess and manage social and environmental risks in a strategic and systematic manner. Procedures and work flows within the framework of SEMS ensure that the Bank’s lending is to environmentally sustainable, socially acceptable and economically viable projects. The Bank’s ‘Green Loans’ and ‘Green Leases’ too contributed to winning this award, as they facilitate the purchase of energy-efficient household equipment, the installation of energy-efficient lighting for households, the purchase of hybrid or electric vehicles, solar panels and other machinery or equipment used for renewable energy, energy efficiency, emission reductions, water and wastewater management and waste management. The installation of solar power systems at branches, the Bank’s use of waste management companies that follow international standards in disposal practices for the dispatch of e-waste and paper, initiatives to migrate customers to digital platforms, and investments in automated technology that minimise the use of paper are a few of the other environment- friendly efforts initiated by the Bank. Commercial Bank was also named among the ‘Top Companies in Asia’ and the ‘Top Green Companies in Asia’ at the 2017 ACES Awards. The ACES Awards organised by the MORS Group recognise successful companies and individuals in Asia across two main domains, leadership and corporate social responsibility. The awards value and recognise services and achievements of businesses large and small, national and international, for their contributions to their communities and the world. Through ACES, companies and their leaders share a platform to take pride in their excellence, to learn, to build connections, and exchange new ideas while showcasing Asia’s best practices for sustainable growth. The only Sri Lankan Bank to be ranked among the world’s top 1000 banks for eight years consecutively, Commercial Bank operates a network of 263 branches and 782 ATMs in Sri Lanka. The Bank has won more than 30 international and local awards in 2016 and 2017 and 20 international awards in the first eight months of 2018.